The Florida Cranberry is an annual fruiting hibiscus plant. It grows without irrigation, yielding many pounds of highly nutritious and delicious fruit. It is virtually drought tolerant and disease resistant. 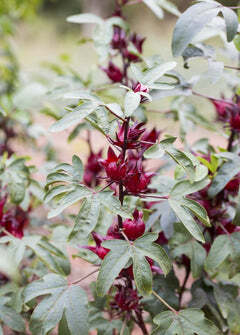 Florida Cranberry is known by many names, including Roselle, Jamaican Sorrel, Fleur de Jamaica or Gongura. Florida Cranberry is most known as a medicinal herb that is proven to lower blood pressure and as the primary ingredient of hibiscus tea, however this multi-faceted plant offers myriad culinary and aesthetic uses. The leaves and flower calyxes can be eaten fresh, dehydrated for teas and fruit leather, distilled, fermented into beer and wine, made into juices or syrups, or used in floral arrangements. We encourage folks of all backgrounds - from growers to grocers, craft beer makers to chefs, pastry chefs to florists - to introduce this fantastic fruit into your garden and kitchen! Soil & Moisture: Florida Cranberry can tolerate nearly any soil condition and is somewhat drought tolerant. It likes rich, moist, sandy, well-draining soil. Exposure: Full Sun, Part Sun. Florida Cranberry performs best with morning sun and afternoon shade. Sow Exotic offers fresh-picked Florida Cranberry September through December. Each 2 lb case of fruit is harvested to order! Pre-order is available year-round.